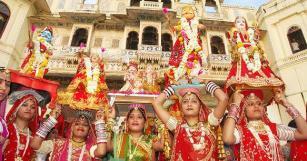 The Mewar Festival is celebrated to welcome the advent of spring. It coincides with the festival of Gangaur in Udaipur, and has a unique charm about it. The women folk gather to dress the images of Isar and Gangaur and then carry them in a ceremonial procession through different parts of the city. The procession winds its way to the Gangaur Ghat at Lake Pichhola. Here, the images are transferred to special boats amidst much singing and festivity. The Mewar Festival of Udaipur welcomes spring, offering the best overview of Rajasthani culture through songs, dances, processions, devotional music and firework displays. Once the religious part of the festival is over, it is time for cultural events where Rajasthani culture is portrayed through songs, dances and other programmes. The festival culminates with an impressive fireworks display.